Suicide is the biggest killer of Australian youth. It’s not easy watching your child in pain knowing there is nothing you can do to take it away. The sheer desperation and sense of hopelessness you feel as your child struggles to get out of bed, pleading to stay at home. Sadly, this is the reality for so many Mums and Dads who see their children slowly but surely decline into a deep and dark hole of isolation. “You know, in grade nine, I would have scoffed at someone if they self-harmed. I thought it was the most selfish, unreasonable, illogical thing to do when you're upset or having problems. Then the next thing I know, the only person left to scoff at was myself, sitting on the floor in the corner of my room furthest away from the door, a pair of stainless steel nail scissors in my hand. Tragically, one in 12 young people, mostly girls, engage in self-harming such as cutting, burning or taking life-threatening risks. Even more concerning, it is one of the strongest predictors of who will go on to commit suicide- the biggest killer of your youth. Sign up to give a monthly donation towards building the Grade 7 to 12 classrooms at Arcadia College. You can help more Gold Coast young people re-engage in school, reconnect with their family and community. Young people like, Remy. Things got worse in year 10 when she lost one of her few friends. A person of support and understanding. A beautiful sole. A daughter. A grandchild, A sister. Remy’s friend. “My friend was anorexic. Ribs. Hollow cheekbones. Discoloured skin. Ankles and wrists no wider than twigs from a dead tree. Why? Well, she was different, like me. She was unique, and didn't meet up to society's standards and expectations. So, she used stories to express her feelings and thoughts, seeming as though her parents kicked her out of home and no one wanted to listen. She was living out of the country at the time and, after a few months of reading her stories online, the updates suddenly stopped. The chapters all but ceased. I started to worry, wondering about her, before I checked the comments under one of her most-read stories. The anonymous reader had told us in a message that my friend wasn't coming back. Sadly, these events happen far too often to your children and that is why Arcadia College exists – to save young lives. To re-engage them back into schooling, reconnect with their loved ones and in your community. Arcadia College takes a very different approach to schooling by offering a safe, inclusive, fun and future focused education and well-being program. Our caring professionals transform students’ lives by empowering them with the skills to cope with their previous tragedies, or the tools to understand their mental illness or learning difficulty to achieve individual success. That is why we are building the ‘Arcadia Youth Hub’ at Robina over the next three years. 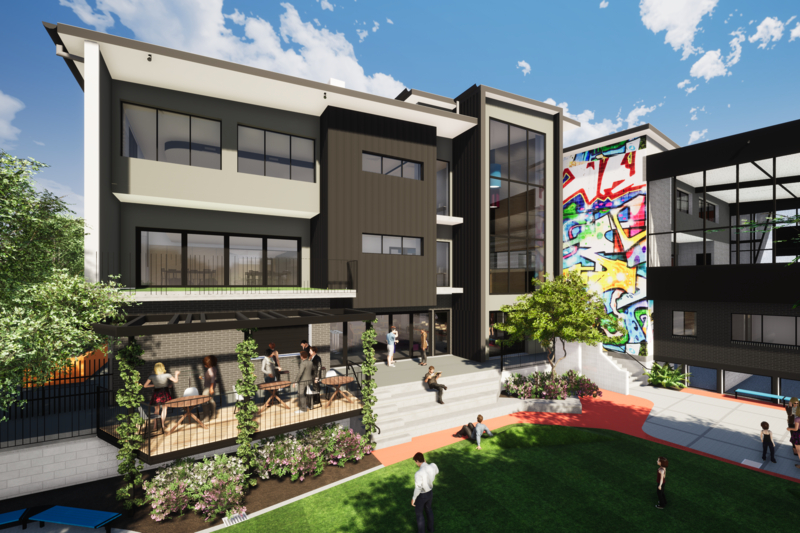 Costing approximately $8m, it will bring together a suite of the best youth focused services in a state-of-the-art, purpose built facility in the centre of the Gold Coast. Complete with a secondary school, youth employment, medical, welfare and outreach services. It will bring together the very best, like-minded teachers, psychologists, nurses, doctors and youth specialists under the one roof – in a first of its kind approach to tackling major community issues. Creating a safe, inclusive and healthy Gold Coast community. Tragically, it isn’t always the case and we need to do more. With your help, we can meet the community need to increase our enrolment from 190 to educate 300 students annually. Please sign up to give $25, $50 or a generous $100 a month to help build our new secondary school. Your donation, can change the lives of 300 Gold Coast students, annually. Students like Remy. With construction of Arcadia College commencing in early 2018, we urgently need your help. “With its' unique and inclusive environment, teachers who truly care and empathise and the constant encouragement to embrace your identity and differences, it is a place of both education and empowerment. Together we can create a safe, inclusive and healthy Gold Coast Community. Sign up to give a monthly donation to help 300 young Gold Coasters re-engage in schooling, with their family and in your local community. People like, Remy. A big thank you to Remy for sharing her story.